We offer complete testing, biopsy, and excision of any skin condition, including melanomas, and other skin lesions. The three most common skin cancers are basal cell carcinoma, squamous cell carcinoma, and malignant melanoma. Basal cell carcinoma is the most common and is the least dangerous. Early detection is the key to the best treatment results. The most common presentation is a persistent, non-healing sore; however, it can look like an irritated reddish patch or a scar. The second most common skin cancer, squamous cell carcinoma, usually appears as a rapidly growing rough red bump that may bleed or ulcerate. It is more prone to spreading to other body areas than basal cell carcinoma. 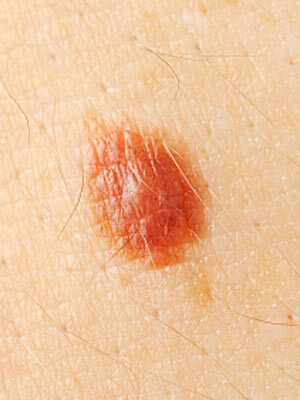 Malignant melanoma is the most dangerous form of common skin cancer. It appears as a dark growth on the skin that may bleed. 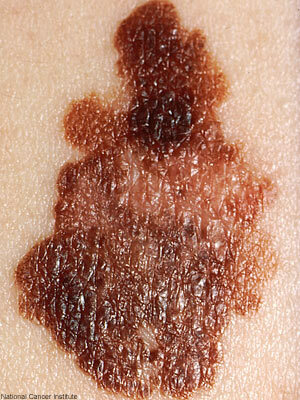 Melanoma will occasionally develop in preexisting moles. Micrographic skin cancer surgery is often used to treat basal and squamous cell carcinomas and in some cases of melanoma. A : Always burns, never tans, sensitive to UV exposure. B : Burns easily, tans minimally. C : Burns moderately, tans gradually to light brown. D : Burns minimally, always tans well to moderately brown. E : Rarely burns, tans profusely to dark. F : Never burns, deeply pigmented, least sensitive. Although everyone's skin can be damaged by UV exposure, people with skin types A and B are at the highest risk. We offer patients the highest quality care available in our state-of-the-art, Medicare accredited, state-licensed surgery center. This avoids treatment in the hospital. Surgery is the most common treatment for newly discovered nonmelanoma skin cancers. It allows the tumor to be removed and generally results in a cure (about 95% of all cases). Unlike other types of skin cancers, nonmelanoma rarely spreads to regional lymph nodes or other sites of the body. However, since patients with one skin cancer are more likely to develop new ones, regularly scheduled post-treatment follow-up is recommended. For patients who do not select surgery or who have medical conditions that prohibit surgery, radiation therapy may be given. Call today to make an appointment, or just come to our clinic. Here are some ways to do an initial check. When you draw a line down the middle of your mole, the two sides should mirror each other. Moles should have a definite border. Melanoma borders usually have notches or scallop shapes. A mole might be dangerous if you notice the color isn't consistent throughout. A mole should be no larger than ¼ inch (6.35 mm) in diameter. A mole that sometimes changes in shape, color, height or texture is suspect. If a new mole starts to itch or burn, it could be a sign that it's not healthy. Any mole that is asymmetrical, has an irregular border, changes in color, size, shape, height or texture, hurts or oozes fluids or blood should be shown to your doctor.